When we first got to Marmaris, about half-hour after touching down at Dalaman airport as a winter getaway from Istanbul, we found a drowsy atmosphere: few people around and most of the countless hotels, resorts, restaurants and pubs—named after English football clubs—were shut down. We could only imagine how busy this place must be in summer, when thousands of holiday revellers crowd the beaches during the day and the bars at night. Frankly speaking, I believe I would like it much better in winter. Unfortunately the weather was not as balmy as we expected, but even with 12°C and a cloudy sky, strolling along Marmaris’ waterfront was very pleasant. 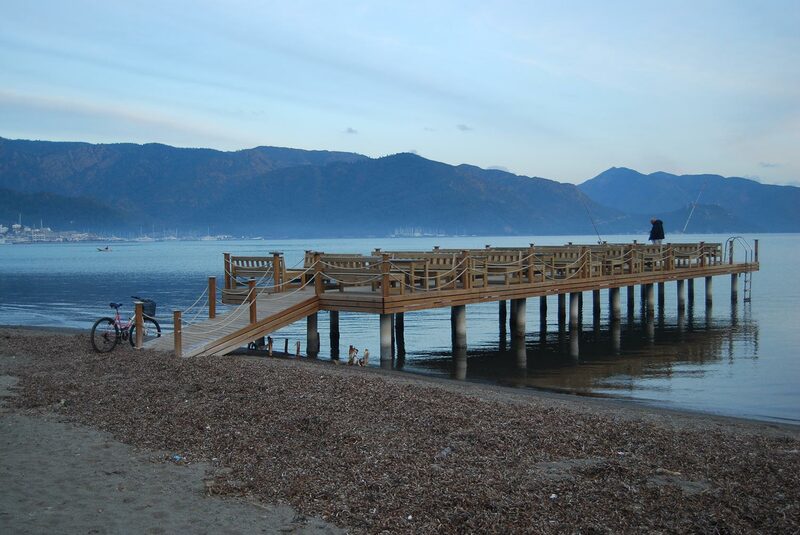 Marmaris used to be a quiet fishing village; now it’s a tourist hotspot. The location of the place is simply gorgeous: a wide natural harbor nestled in a bay surrounded by pine-crested mountains. Unfortunately the building-spree that followed the growth of tourism has largely disfigured the urban landscape, so much so that the once little fishing village is now almost entirely covered of modern concrete buildings which don’t really fit in in the natural scenery. The only part of Marmaris which has been spared by modern constructions are a few pebbled alleys around the pretty hill-top castle. After visiting the small museum housed in the castle, we lingered on the ramparts to soak in the amazing views over the bay and the yacht-filled marina. 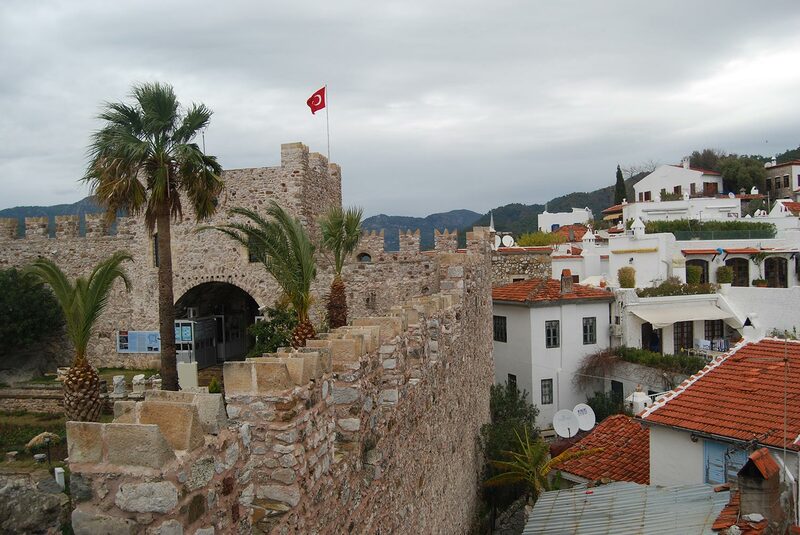 Marmaris’ castle is one of the last vestiges of the city’s past. From there we could clearly see the emerald green Cennet Adasi, literally translated as “Paradise Island” but actually a peninsula which stretches across the bay and nearly encloses it. Unconcerned with the damp weather and the road warning signs, we drove the dirt road of Cennet Adasi and then hiked a short trail in the forest to reach Nimara Cave. Nobody else was there; the only noises we could hear were the birds chirping on the trees and our own voices echoing in the stalagmite-filled grotto. What I most enjoyed of this trip were the astonishingly beautiful natural landscapes that bless the area. 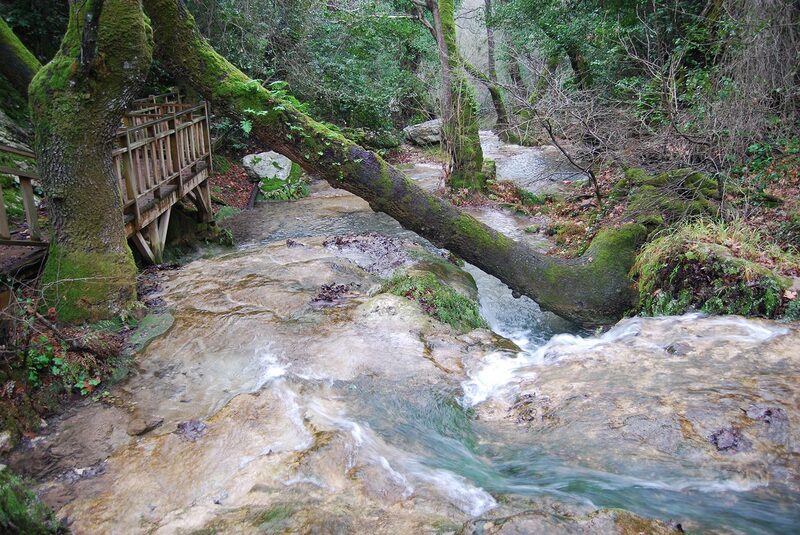 In Marmaris’ environs, near the mountainous settlement of Orhaniye, we went for a hike in the woods along an enchanting stream with waterfalls and then we stopped at Kızkumu plajı, a red-sand strip washed away by shallow, nearly-still water in a tranquil bay. The hikes from Marmaris are worth leaving the beach for. However, it is in the elongated Datça peninsula separating the Aegean and the Mediterranean Sea that nature truly regains a primordial, savage appearance: rainbows spanning over rugged mountains, vast olive groves, lush pine forests, dramatic cliffs clashed by rumbling waves and breathtaking sea views, a wilderness that vividly reminded me of the rough coastline of less temperate places like Ireland, a place which is so dear to me. Probably thanks to its remoteness—there is no local airport and the roads are still in poor conditions—the Datça peninsula, unlike Marmaris, is still largely unspoiled by the injuries of the tourism industry. 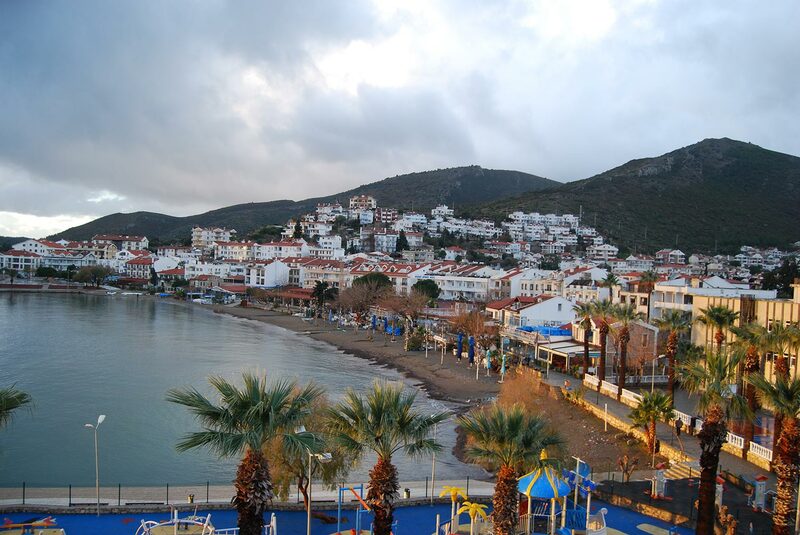 Datça, the only town, consists of clusters of hotels and holiday apartments facing the sea. The hotel where we stayed gave right onto the short but charming waterfront lined with fish restaurants. 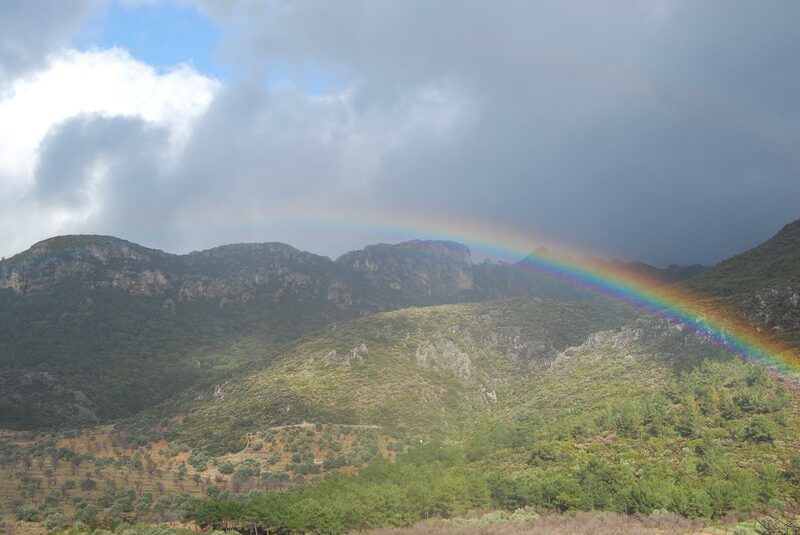 Nothing says “unspoiled by tourism” like a near-perfect rainbow. Apart from the beaches and a few olive oil factories and wineries, the main draw of the area is the ancient city of Knidos, located at the tip of the peninsula where the waters of the Aegean and Mediterranean Sea converge. To get there we had to cross the entire peninsula following the winding road up and down forest-covered mountains, through sleepy villages and along shingly beaches and rocky ravines. Founded in the 4th century BC, the Greek city of Knidos with its two harbours was a flourishing trade center on the commercial route between the eastern and western Mediterranean. The ruins of several temples, a basilica and a sea-facing theater testify its past grandeur. 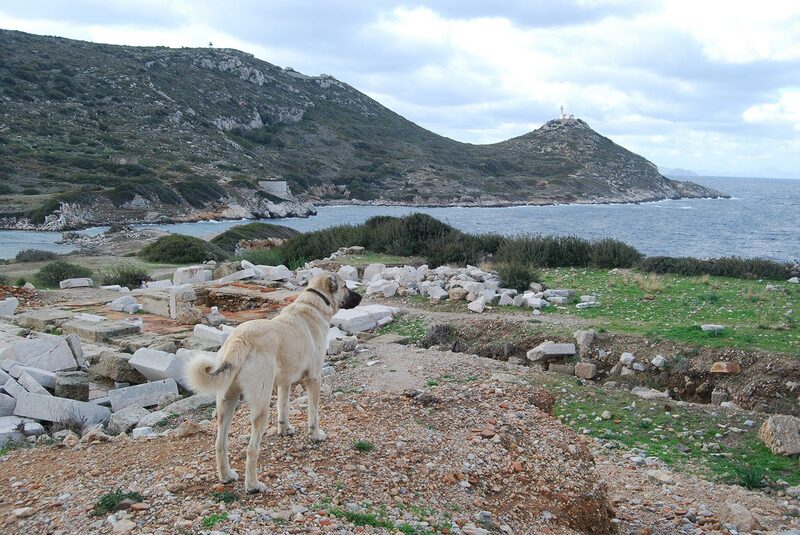 As expected, we were the only visitors, and our guide through the archaeological site was a white shepherd dog. Little-known fact: Stray dogs are the best guides. Exploring Knidos all by ourselves was an incredible experience that reconciled us with nature: millennia-old stones; the fierce wind shaking the shrubs; the scent of thyme, rosemary and salt filling the air; and mesmerizing turquoise water foaming against the rocks. Welcome to the Turkish Mediterranean. 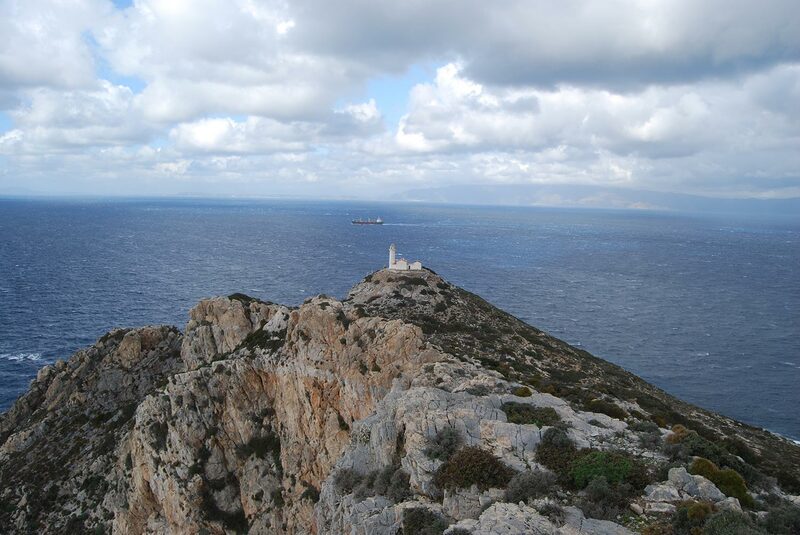 Suddenly I felt an impelling urge to be alone and plunge myself into the wild, so I set out to reach the hilltop lighthouse. From the summit, all I could see were green islands hanging between the immense expanse of sea and sky. A view can hardly get better than this.